Forget the war – Vietnam has one of the youngest and most dynamic populations in Asia, and the country has great beaches, fascinating cities, ancient culture, incredible food. 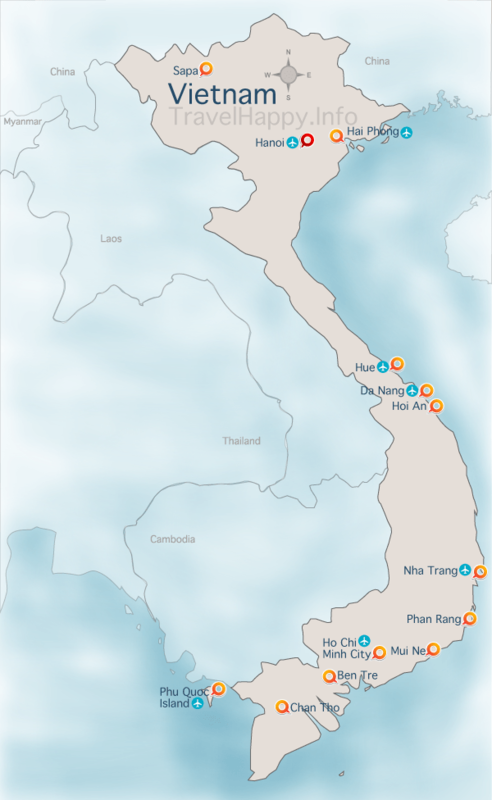 Use Travelhappy’s Vietnam map to plan your trip. Extremely compact for a capital city, Hanoi is bursting with history at every street corner, making it a picturesque if hectic place to explore. A UNESCO World Heritage site, the traffic-free streets of historical Hoi An are a joy to wander, especially with the scores of restaurants and pleasant riverfront nearby. Use the search box below to find out departure times and prices for Vietnam buses and trains. Enter your starting point and destination.